After winning their first Atlantic Division title in two decades, the New York Knicks entered the 2013-14 season with championship expectations. (Well, their owner did, at least.) Things fell apart quickly, though, as the Knicks lost 13 of their first 16 games, digging a hole out of which they couldn't climb. The offseason trade for Andrea Bargnani worked out as poorly as everyone expected, with gaffe after gaffe eliciting boos from the very start of the year through his season-ending injury. J.R. Smith signed a new contract, then promptly had knee surgery and got suspended for testing positive for marijuana; in the biz, we call that "foreshadowing," as J.R.'s season proved equal parts tumultuous and disappointing. Tyson Chandler's leg broke, and then his spirit did, which happens when you're constantly cleaning up the messes of a roster full of terrible defenders. Raymond Felton was perhaps the NBA's worst starting point guard last season. Expected to break out, Iman Shumpert stayed shackled. The veteran frontcourt (Chandler, Amar'e Stoudemire, Kenyon Martin, Metta World Peace) proved injury-prone and ineffective, and New York's reserves offered little respite on either end of the court. That placed the burden for keeping the Knicks competitive squarely on Carmelo Anthony's shoulders. Despite the All-Star's best efforts — 27.4 points, 8.1 rebounds and 3.1 assists in a league-leading 38.7 minutes per game, a 40.2 percent mark from 3-point land, a Knick-record 62 points against the Charlotte Bobcats — they fell short. New York won 16 of its final 21 to briefly re-enter the playoff picture, but finished one game behind the Atlanta Hawks for the No. 8 seed, the first postseason miss of Anthony's career. Anthony's back after testing free agency. (For the last time, he says.) With a new head coach and a shuffled supporting cast, 'Melo has tempered expectations, but still expects to return to the postseason. Is that wishful thinking in a deeper East? 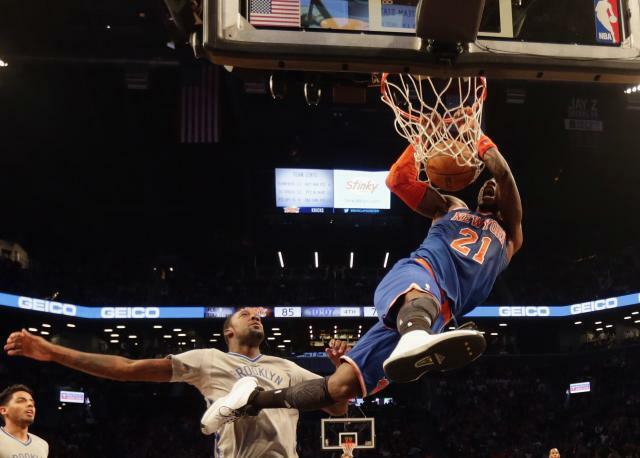 Or can a new system and a few personnel tweaks give the Knicks the boost they need? From division champs to the lottery. “The East is big, man." Rancid Swiss cheese D. Melo’s best, wasted. A rising Bargs sinks all ships. Some, but probably not too much. One big plus: retaining Anthony's services. Yes, it cost James Dolan a pretty penny, and it's unlikely a 35-year-old Anthony will merit anything near the $27.9 million he'll make in 2018-19. 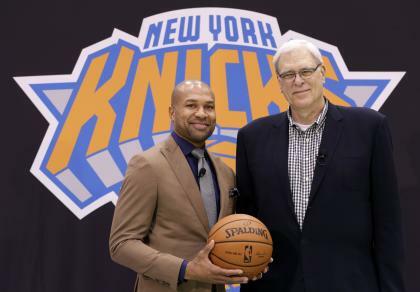 In the here and now, though, 'Melo remains one of the league's most devastating scorers, an offensive force whose inside-out skills seem a hand-in-glove fit for the triangle offense the Knicks will implement under Phil Jackson and new head coach Derek Fisher. (Provided, of course, the ball keeps moving.) He's coming off arguably the best season of his career and looks to be in fighting trim, which bodes well for a Knicks squad looking to improve on last year's 11th-place finish in points scored per possession. Beyond 'Melo, though, none of the Knicks' summer moves seem likely to vault them into contention. A multiplayer trade with the Dallas Mavericks brought an upgrade at point guard (so long, frustrating firearm-brandisher Felton; hello, Jose Calderon) but at the price of a downgrade at center. The version of Chandler who finished last season didn't bear much resemblance to the one who won Defensive Player of the Year, but he's still more reliable than Samuel Dalembert, who can protect the rim and clear the glass when in the mood, but has also apparently never met an alarm clock he couldn't ignore. The Knicks also brought in veteran Jason Smith to add some midrange shooting and toughness to their frontcourt rotation. The former Philadelphia 76ers and New Orleans Hornets/Pelicans big man could prove a bargain on a one-year deal at the taxpayer's midlevel exception, provided he can stay off the trainer's table. The task of making the most of this mix falls to first-time bench boss Fisher, who now must validate the faith his mentor showed in hiring him mere weeks after he last suited up for the Oklahoma City Thunder. The 40-year-old will surely experience growing pains during his maiden foray into coaching at any level, as contemporary Jason Kidd did in his stumbling start to last season. Then again, even a neutral coaching job could represent an improvement over the ousted Mike Woodson, who learned the wrong lessons from the Knicks' 2013 playoff loss to the Indiana Pacers — "we got beat by a bigger team, so let's play more bigs and go away from our small-ball offense" — and never found any answers to stop New York's freefall. For the Knicks to rise up the standings, Fisher must learn from Woodson's missteps and quickly translate his vaunted "veteran leadership" into on-the-bench acumen. 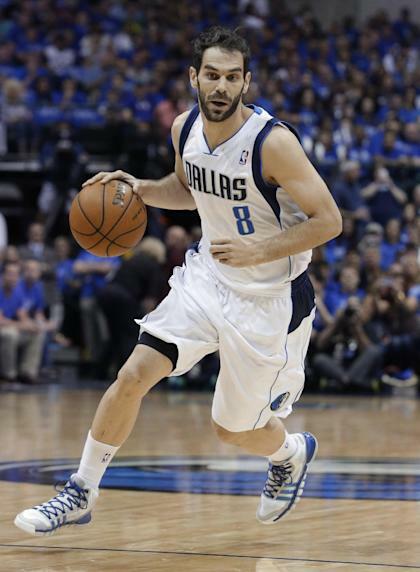 Calderon's still a heady pick-and-roll playmaker, but he thrived in Dallas working more as a spot-up option opposite pick-and-rolls run with Dirk Nowitzki by the likes of Monta Ellis and Devin Harris. The Knicks don't have near the playmaking depth of last year's Mavs, but if you squint, you can see a path to some fruitful possessions with Calderon and Prigioni (and perhaps Larkin or even J.R. Smith) taking turns running the two-man game with Anthony while shooters spread the floor away from the play. Calderon has his shortcomings, but he should be a clear upgrade over Felton as both a decision- and shot-maker for a Knicks team often starved for supplementary creation when Anthony stalls. If he performs as advertised, he'll bolster New York's hopes of producing an elite offense. Defense. The Knicks fell from middle-of-the-pack (tied for 16th in points allowed per possession) in '12-'13 to 24th among 30 NBA teams in defensive efficiency last year, amid glaring lapses that often bordered on the unbelievable. That was before they traded Chandler, their lone interior deterrent (albeit one who was injured, overtaxed and often listless last season), and replaced him with the intermittently interested Dalembert and the infrequently healthy Smith. Moving away from Woodson's switch- and double-heavy scheme toward a simpler system in which everybody knows what they're supposed to do could help ... but then there's the small matter of actually doing it. Felton was a sieve, but the slow-footed Calderon won't offer much of an improvement. Expecting Bargnani and Stoudemire to be anything more than nightmarish seems a fool's errand. The often-spacey J.R. tops out as an average defender at best when engaged; Tim Hardaway Jr. needs a telescope to see "average at best." Slimmed down or no, Anthony will likely struggle to check quick opposing threes. With the possible exceptions of Shumpert, noted sneak Prigioni and sparingly used Cole Aldrich, the Knicks don't have many players capable of providing even slightly-above-average defense. That makes climbing out of the bottom-third of the defensive rankings seem unlikely. Shumpert. Knicks fans look at the 24-year-old Georgia Tech product and see a potential star, a big guard who can lock down on the wing, who can finish at the rim and knock down open 3s, and who plays with the sort of motor and swagger that New Yorkers love. Non-Knicks fans see someone whose defense isn't that good, who has shot 39.1 percent from the field for his career, and whose hairstyle and freestyles get more attention than his game merits. This is his chance to prove he's closer to the former than the latter. After the injuries, surgeries, myriad trade rumors and squabbles that have marked Shumpert's last two years, he's eager for a fresh start under a coach who might not hate him in an offense where he might do "more than standing in the corner.” He's shown flashes of being able to — his impressive Game 6 against the Pacers, his back-to-back big games against the San Antonio Spurs and Houston Rockets — but in his fourth season, he needs to show more than flashes. If he can increase the frequency of those performances while actually serving as the stopper he's reputed to be, he could put himself in line for a lucrative second deal when he enters restricted free agency next summer. If not ... well, at least his "hold up, hold my phone" celebration made it into "NBA 2K15." Hardaway. He can fill it up, earning selection to the All-Rookie First Team after leading all rookies in made 3-pointers while ranking fourth in per-game scoring (10.2 points in just 23.1 minutes per game) and long-range accuracy (36.3 percent). On an often plodding Knicks team that played at the league's second-slowest pace, Hardaway offered a much-needed injection of open-court punch, averaging 1.31 points per possession finished in transition, the 35th-best mark in the league, according to Synergy Sports Technology's game-charting. He's a confident shooter — too confident for some fans' tastes — who very much looks the part of an instant-offense off-guard. The problems, though, came when Hardaway was asked to do anything other than go for goal. Hardaway assisted on just 5.8 percent of his teammates' baskets during his time on the floor; he's one of only 24 guards in Basketball-Reference's database to post an assist rate that low while playing more than 800 minutes in a season. He grabbed a lower share of available rebounds than any other shooting guard in the NBA who played at least 500 minutes. He was an inattentive turnstile on defense, ranking 440th in points allowed per possession by Synergy's numbers — 482 players saw NBA action last year — with the Knicks allowing a dismal 109.2 points per 100 possessions when he played, a worse mark than the dead-last Utah Jazz defense. He was as one-dimensional as it gets in Year 1, and the Knicks suffered for it. Hardaway's saying the right things after working out with the USA Basketball Select Team this summer, talking up a desire to improve on the defensive end. Showing that he knows where to stand would be a start, as would making the occasional pass and helping his bigs on the glass every now and again. If he can improve from "glaring weakness" to "somewhat serviceable" in the other areas of his game while continuing to show the shot-making prowess he displayed as a rookie, the 22-year-old could be a player on the rise. Anthony plays even better after getting his megadeal, pairing with Calderon to lead the Knicks to a top-five offensive finish. After struggling last season following summer knee surgeries, J.R. and Shumpert come out healthy and hot, boosting New York's perimeter playmaking and defense. The team takes to the triangle quickly while Fisher coaxes a league-average defense out of a roster led by Dalembert, Shumpert and a surprisingly impressive Aldrich. Early looks like the steal of the draft, Stoudemire offers enough interior scoring to offset his D, and Bargnani mostly stays out of the way. New York rides an elite offense to a middle-of-the-pack playoff seed and a return to the second round. Anthony, now on the wrong side of 30, breaks down amid the strain of carrying the team, submarining the Knicks' offense. Fisher shows a Woodsonian predilection toward big lineups that often pair Stoudemire and Bargnani, and New York plummets to dead last in defensive efficiency. Shumpert still can't locate his confidence and shooting stroke. J.R. still can locate opponents' shoelaces and recreates the first 35 games of last year rather than the last 45. Furious at paying $90 million for one of the three worst teams in the East, Dolan drops any pretense of staying out of Phil's way and makes Prigioni his personal kazoo carrier. 37-45 — hey, that sounds familiar! — and another ninth-place finish in the East. Oh, well. At least the Knicks will have their first-round pick this time.